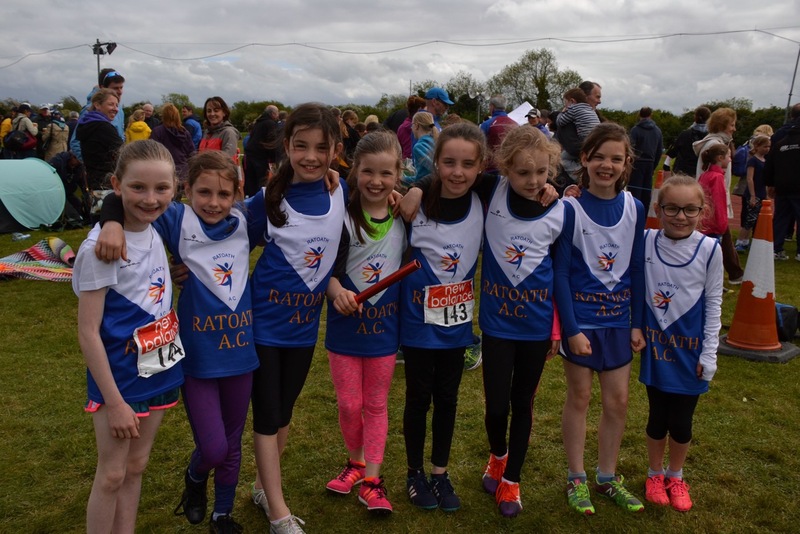 Big numbers attended the Leinster Juvenile Relays yesterday at Le-Cheile Ac, Leixlip which made for a highly entertaining event with fierce competition for medals in all age groups. We had 14 teams on the day that took to the track and we came away with an incredible 9 medals from u9s up to u17s. 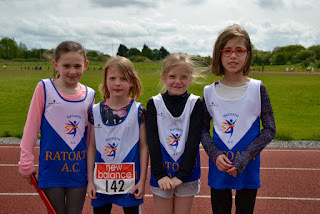 In the morning session our u9 girls got their first taste of Leinster level competition and took the first medal of the day finishing 3rd, great running and passing from Oliva Ryan, Aisling Shevlin, Aoife Skerrett and Mia Ryan. Our u11 girls were flying in the heats and were 3rd fastest in qualification for their final, unfortunately things didn’t go to plan in the final where they finished 5th, they will be back to fight another day, well done Saoirse Carrigan, Amber Lane, Amelia Holland and Katie Doherty. Our u11 boys after only qualifying as 5th fastest from their heat ran a stormer in the final taking 2nd, fantastic running from Gavin Witter, James Kelly, Harry Bogan and Fionn Heffernan. Our u13 girls were out to defend their Leinster title and were unlucky not to come away with the gold again finishing 2nd in a very tight finish with KCH, the girls ran a great time of 55.2s and will certainly be in contention for medals at Nationals in July, well done Laura Kelly, Sophie Quinn, Aisling Stratford and Aobh Forde. Our first Gold of the day came from the u15 boys, Our A team put in an impressive run clocking 51s to take their first Leinster title and with a bit more training they should go well at Nationals, well done Oisin McKenna, Jed Walsh, Oisin Kelly and Tom Kilganon. Our B team of Kyle Witter, Ciaran Rogers, Fionn Drummond and Marcus Clarke were unfortunate to drop the baton when in a great position to take another medal, the lads having to settle for 5th in the end. Our u17 boys of Daragh Casey, Matthew Buckley, Fergal Kilgannon and Rafa McCaffry were our last team to take to the track in the morning session, and while not a full strength the lads still came away with bronze in a very competitive field. The u10 girls kicked off the afternoon session and it was great to have 2 girl’s teams competing from our club, the future certainly looks bright for these girls with both teams qualifying from their heats for the final where they finished 4th and 8th, well done Lizzy Hartland, Ava Skerrett, Aisling Clare, Amber Lane, Catherine Drummond, Sheana Fitzpatrick, Claire Rogers and Kate Smith. Our multi-talented u12 girls impressed again with our A team finishing 2nd in another tight finish, the girls ran an outdoor pb of 58.17s and will look to go even faster in July, our B team put in a good run just missing out on qualification for the final, well done Katie Doherty, Niamh Murphy, Caoimhe Fitzsimons, Cara O’Sullivan, Ciara Coroner, Sarah Forde, Kate Raftery, and Lauren Fewer. The race of the day if not the decade came in the u14 girls event, our u14 girls teams who will never be written off again put in the performance of the day taking gold in a thrilling final. After only finishing 3rd in their heat and qualifying as 6th fastest for the final the girls had to contend with a ball being kicked on to the track in the final, fortunately the final was re-run as this incident caused a serious impediment to Aobh Forde on the final leg. The girls held their cool in the re-run, and their fitness certainly told with our girls running much faster in an exciting race that saw all 8 teams cross the line in a blanket finish, 1 hundred of a second eventually separating 1st and 2nd. Fantastic running, strength and character shown by Aimee Doherty, Sophie Quinn, Amelia Campbell and Aobh Forde. Bets were being taken all day to see who would come out on top in the u16 boys final, with both our u16 teams being split evenly it was always going to be a close affair. After a very tight race our team of Kevin Conway, Matthew Buckley, Tom Kilgannon and Jed Walsh came away with the gold with our team of Oisin McKenna, Rafa McCaffery, Oisin Kelly and Ben Toole taking bronze. A great achievement from this talented bunch of lads coming away with 2 medals, the competition for places on the A national team will be mighty. 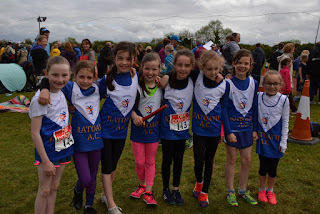 Well done to all teams who competed and thanks to Le-Cheile Ac who hosted a great event. Congratulations to all teams who have qualified for Nationals.